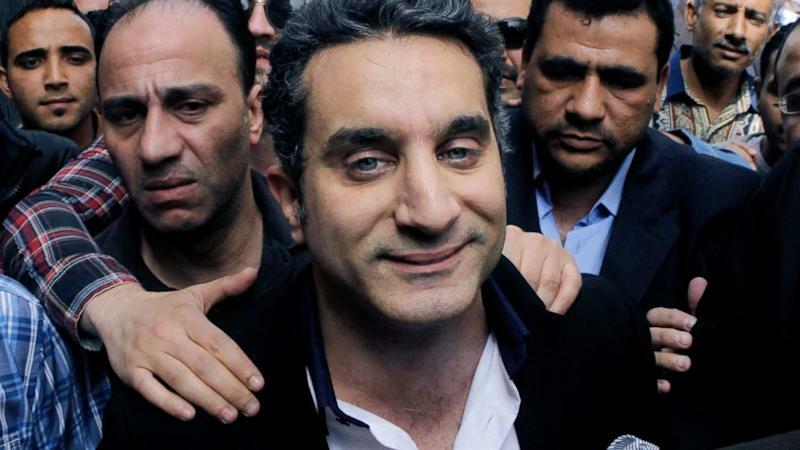 In one of the most highly anticipated nights of the year, comedian and political satirist Bassem Youssef returned to Egypt's airwaves on Friday from a four-month hiatus amid fevered speculation over what his act would look like after the summer's military coup and the violent upheaval that has followed. With islamist President Mohammed Morsi - a frequent target of Youssef's - now gone, would he set his sights on General Abdel Fattah al-Sisi, Egypt's de facto ruler and the subject of a growing cult of personality? Would he risk alienating his fans - many of them ardent Sisi supporters - and anger the country's military rules who have cracked down on dissent and media criticism? It was a high wire act and Youssef walked it carefully. The incredibly popular Youssef, often described as Egypt's Jon Stewart, launched the third season of his talk show El Bernameg (The Show) with his trademark "Welcome to The Show!" From there, he focused his attention not on Sisi but on the rabid hero worship that has grown out of the general's removal of Morsi in early July. In one skit he mocked the adoration of Sisi with a woman (named 'the public') calling into a love advice show and describing the love of her life as "an officer as big as the world" who has "a sovereign streak." During a more serious moment, Youssef acknowledged that the political unrest in Egypt has made the societal pressure on him so great that it's difficult to produce the show. "Unfortunately, the general mood in Egypt does not allow us to accept our present reality," he said. "People who live in a constant state of fear and anticipation are not capable of accepting an opinion different from their own, let alone satire." Sisi's supporters reject the notion that he led a military coup, insisting that he was answering the call of the millions who turned out in the streets on the June 30 anniversary of Morsi's election, demanding his ouster. Before the military took over and installed an interim president, Youssef had often skewered Morsi's government on his show. It was catnip for Egypt's secular liberals and Youssef's popularity skyrocketed. Many of his fans felt that Morsi – who came from the Muslim Brotherhood – was imposing his islamist view on the country and was governing without transparency. Many of those same liberals had protested in Tahrir Square in 2011 to oust President Hosni Mubarak, whom they viewed as a dictator. But facing the prospect of growing hardline islamism in Egypt, they have largely flocked back to the military's side. Days before Friday's show, Youssef predicted that the supporters of Gen. Sisi would be just as angry as Morsi's during the last season of his show. "They will not stand a word against Sisi. Their defense of freedom and democracy will stop the minute they are annoyed by the same joke they applauded for before," Youssef wrote on Tuesday in his weekly column. "When I confront them with that, they repeat the same statements made by the Brotherhood. Statements like: "It's inappropriate. It's not the time for this."" "The truth is, there's no tolerance by the Brotherhood or by those who call themselves liberals," Youssef continued. "Everyone is looking for a pharaoh his size." During Morsi's brief rule, islamist lawyers had tried to get Youssef charged with for insulting Islam and the president. He was brought in for questioning but released. In what could be seen as a stark warning to Youssef on Thursday, a panel of judges connected with the Administrative Court issued an opinion saying that Morsi had tarnished the image of the president's office by failing to prosecute Youssef. The presidency "is a post traditionally respected and revered by the Egyptian people," the daily newspaper Al Masry Al Youm quoted the report saying, "It is the symbol of the state." Youssef is a cardiac surgeon who was inspired by Jon Stewart and started posting satirical videos online. His first video, shot in his laundry room weeks after the revolution that deposed Mubarak, was viewed by millions on YouTube. He soon made the transition to television, first at the privately-owned OTV and then CBC for the second season. Youssef's meteoric rise won him a spot on this year's TIME Magazine's 100 Most Influential People list, where he was honored by Stewart. "The only real difference between him and me is that he performs his satire in a country still testing the limits of its hard-earned freedom, where those who speak out against the powerful still have much to fear," Stewart wrote. "Yet even under these difficult circumstances, he manages to produce an incredible show: a hilarious blend of mimicry, confusion, outrage and bemusement, highlighting the absurdities and hypocrisies of his country's rebirth, all wielded with the precision of a scalpel…"
Youssef has an intensely loyal following and his biggest fans after Friday's show will be those who wanted to see Morsi gone but also disapprove of the heavy-handed way the interim government is now running the country. Many of Sisi's supporters had already written Youssef off, calling him "vulgar" and "out of touch" on social media. But for all the jokes made about Sisi's supporters on Friday night, Youssef made clear that he understands the political minefield in Egypt these days and steered clear of criticizing the man himself. "It is a very highly mobilized nationalist feeling in the country," American University of Cairo journalism professor Naila Hamdy told the Associated Press before the show. "Even Bassem Youssef would not want to go against that."